Clarke's Whistler Highcamp' is a 2 bedroom/2 bath luxury townhouse with everything you want for a great "mountain cabin" vacation. Come on up, we welcome the chance to share it with you. Our home is in the Taluswood area above Creekside, nestled in the quiet trees on the shoulder of Whistler Mountain. Think of it as your own private dream ski lodge. It is really comfortable and everyone thinks it is a special place to stay. Renting Highcamp directly from The Clarke Family is safe, easy, and a real bargain. 100% guest satisfaction for over 16 years! We call it 'Whistler Highcamp' because it has the feel of a good climber's 'campsite' on the mountain, but with all the warm soft comforts of home. No one’s roughing it here! It is a big 1100 sq.ft. top floor townhouse, and has a very nice open floor plan and vaulted ceilings throughout. Beautiful log post and beam interior and exterior trim gives it a warm 'ski cabin' ambiance. Enjoy two big decks - with fabulous valley, lake, and mountain views. The romantic wood fireplace and heated tile floors will keep your toes warm. Taluswood is a very quiet mountain setting, yet just minutes to the Village. Easy/moderate ski in/out trails are steps away. Hiking and biking trails start right out the front door. Our big private hot tub is very popular, and we have a common pool & hot tub, and tennis courts. Parking is free and we have a private garage The kitchen is fully equipped with everything- no need to eat freeze dried camping food in this campsite! We have a BAr-B-Que but you have to bring your own steaks. There are great views from the kitchen, decks and living room. Bear watching is possible from the deck! Highcamp sleeps 7 people - 1 memory foam top king, 2 pillow-top queens including a nice sofabed, and 1 twin upper bunk. The king bed in the master bedroom is next to a patio door opening to the sun deck with our new hot tub. From there you have a nice southern exposure and a view of the top of Whistler Peak. When you wake up in the morning you can get a good view of present weather conditions, so you can decide if you want to sleep in, jump in the hot tub, or get out after first tracks for powder. All options are good at Clarke's Whistler Highcamp! We accept payment by major credit cards and have a perfect 16 year record of satisfied guests. We are approved members of the Whistler Resort Association, and we have our own Whistler business license and membership in Whistler Tourism. Booking directly with us is safe and easy, and saves you about 20% on cost of your accommodation by eliminating hotel taxes, commissions and extra fees. Plus our prices are lower to begin with when compared to this quality of accommodation. We also offer discount lift tickets, adventure tours, equipment rentals and a variety of discounted resort-wide services that enable your to make your own custom bargain luxury vacation package. If you are looking for that true mountain ski vacation experience, Clarke's Whistler Highcamp is a fantastic choice. Give us a call and come on up! The Clarke Family built and operated Crystal Mountain store from the mid 1970's to mid 1980's, and we consider ourselves a skiiing family, thanks to Dad. Highcamp is our gem in the mountains, and we love hearing about all the fantastic Highcamp vacations for people from all over the world. Most Clarkes live aound the south Puget Sound area, and Jimi lives in Portland. We take a lot of pride in providing a superb experience for our guests. If you want quiet, clean, comfortable mountain lodging, you need not look any further. Luxury in the woods! This is our home and set up for total comfort for everyone. Guest are always telling us how great their vacations were at Highcamp. It is really romantic - we've had at least 3 successful marriage proposals here and one confirmed conception. Maybe it's the fireplace, maybe it's the views, maybe Highcamp just attracts those who want ambiance. View of lake from home. Nice quiet one that really works. Fully equipped with everything you need. 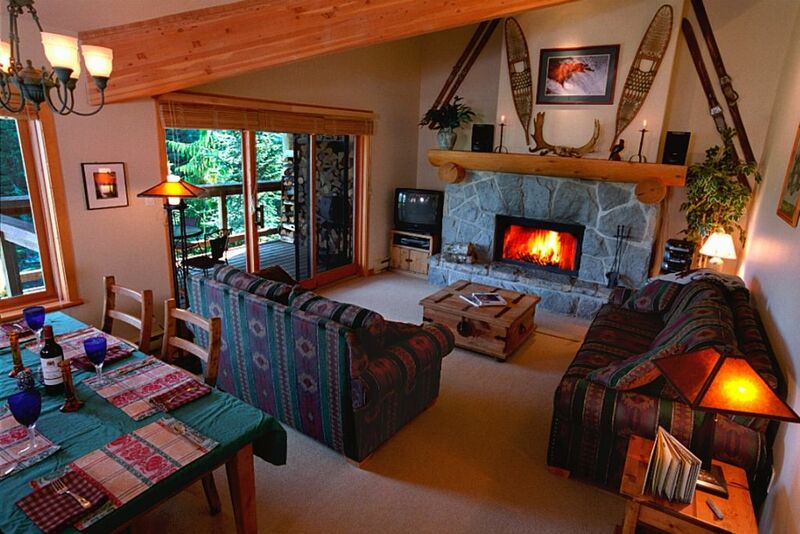 Wonderfully warm and comfortable, quiet, mountain cabin like ambiance! Loved the heated floors. Greatly appreciated having available so many items from plenty of Kleenex, paper towels, cooking utensils, laundry detergent, spices etc... super thoughtful. Also loved codes instead of keys for doors/garage. As noted, some of the window coverings are older. They could do with refurbish so one can open them and enjoy the beautiful views! Hot tub was lovely and nice temp. Thank you Ingrid! It was a pleasure sharing our home with you. You were a great guest - come back again soon! Not true ski-out. The walk to the ski-out trail is down the street and I would estimate it at less than 150 yards/meters. The ski-in trail leads you out of the woods a few units away and is relatively close. The condo is in a beautiful location in the treetops with large nicely decorated unit but it is beginning to show its age. The beds were among the most comfortable I have slept in and the private hot tub was excellent. We enjoyed reading the guest book as well. There were nice touches with a greeting card and candy. We enjoyed having the essentials such as salt and pepper, sugar, paper products, etc. but there was no complimentary coffee. The full size bath products were a plus but towels in the master had holes in them and one was slightly dirty. The kitchen was the biggest issue and is what initially caught my attention as very dirty: filthy dishes were put away in the cabinets as if they were clean, lipstick on the glasses, dirty cooking utensils and pans, the floor and microwave were covered in grease, condiments in the refrigerator were expired. I chose to book this unit based on previous reviews which were all very positive so I am not sure what happened. Perhaps the cleaning service has changed or the owner hasn't been to the unit in a while to see the condition it is in, there were a lot of DIY repairs that need attention (sink fixture, caulking, blind cords, heater knobs, unfinished ceiling paint, thermostat covers taped shut etc.) not deal breakers by any means but not 5 star. The clothes dryer is a heat pump style and would not dry our clothes on any setting. We tried to take out the trash but the trash house was locked and there was no sign of any keys. If I didn't have to clean the kitchen before cooking I would have given up to 4 stars. Thank you for the review Craig. After 20 years of successfully sharing Clarke's Whistler Highcamp we really welcome the good feedback, and continue to look for ways to improve the quality accommodation we provide. Our Taluswood home is universally considered true ski-in and ski-out, and this is a first anyone has ever said otherwise. We try to be real clear about the accessibility to the hill. It is about 150 steps out the door to the ski-out trail down to Creekside base, and when you ski home it is about 75 steps to the door. Few homes are much closer. As for the kitchen situation, we became aware of a dishwasher issue after you left. The drain filter was slightly clogged and there was no rinsing agent in the reservoir. Previous guest had put dirty dishes in the cabinets, and uncharacteristically the cleaners did not catch this. We have discussed this at length with them and are confident it won't happen again. Note our cleaning service has been with us for 20 years and has been fantastic. We take great pride in the cleanliness of Highcamp, so we all take this feedback very seriously. The clothes dryer is brand new, and a ventless type that does not heat up the clothes like a traditional dryer does. The clothes don't feel dry as a result, but they are. There is a water reservoir that needs to be emptied, and perhaps it was full. It works fine, but to be honest I wish I had just bought the other type of dryer. The key to the garbage shed is by the door inside the garage, as stated in the notes on the fridge door. The one sliding door window blind was partially damaged by prior guest, and has since been removed from that whole back deck door. It is an improvement as more light comes in and you don't need the blinds for privacy. Again, we appreciate your feedback and can assure you of a perfectly clean kitchen when you come back and stay with us again. Remind me of this string of communications next time and we'll find a way to provide you with some form of compensation. We strive for perfection and your feedback helps as to focus on that goal. We had a wonderful & cosy stay at Highcamp. Loved the log fire, well stocked kitchen, hot tub and convenience of ski in/out. We had a 4yr old who had only skiied a few days and she managed to ski between our legs on the ski in/out for a few days and then she could do it on her own. Kids enjoyed the books and there were lots of bathroom products available which was so convenient. Damian was super friendly and responsive to a few things we needed, thank you. FYI we were not able to hire a 4WD big enough for our family of 6 so we had to have a Dodge minivan and on one occasion we couldn’t get back to the accommodation from Creekside after some decent snowfall so a 4WD would be a safer option. Having said that, we parked down the road, walked home in the snow which was a fun adventure and easily retrieved the car the next day so it was no problem. Thanks for the amazing memories, Whistler was incredible! Emma was a great guest, and we love hearing about the progress on the slopes of her daughter. This makes sharing our home all the more fun. She also gave us some good feedback about needed kitchen tools - we delivered a garlic press to her. Hard to believe there was no garlic press already, no kitchen is complete without one! Thank again Emma, come back soon! Pictures do not do this condo justice! We had a terrific week at Highcamp. I cannot say enough good things about the owners and the condo. It was so nice to stay in a condo where the owners make sure you enjoy their home as much as they do. It wasn't a soulless rental where everything was done on the cheap. There were loads of towels. Not thin skimpy towels, but nice fluffy towels. They don't skimp on the paper products which was another bonus. There is a great coffee pot and filters, plus an espresso machine. Even tons of different baggies, foil, and plastic wrap. There are basic spices and even some condiments in the fridge. There is an ample supply of cutlery, plates, glasses, pots and pans, etc. And there is a ton of soap, shampoo and conditioner. I have stayed in so many condos where you cannot find something you need to make a proper meal. The hot tub right on the deck outside of the master bedroom is just what we needed after a long day of skiing. To ski in and out is just a short walk down the road to the trail. If you have beginner skiers who cannot ski narrow trails, you might want to consider driving down to the base to park and ride the gondola up. They even have a book with restaurant recommendations. The owners are fantastic and answered all of my questions regardless of how many I asked or how silly they were. I would highly recommend Highcamp and will return if I find myself heading out to Whistler again! We had a very enjoyable stay. The owners were very helpful, even calling us the morning we left to make sure everything went well. The property is just as advertised. I would definitely rent this property again. For 16 years we have had satisfied guests from all over the word enjoy our home in Whistler. Highcamp is the perfect place for your dream vacation in Whistler. We stayed with friends for several days in January and had a wonderful time. The cabin is exactly what we were looking for in a ski getaway – rustic, cozy, gorgeous views. The cabin is just minutes away from the resort base and village, but it’s tucked into the forest so it seems like you are a world away. Relax by the fire, sip hot chocolate on the patio, and sooth your muscles in a private hot tub. Jim is the consummate remote host and provides everything you need to have a great time – including a book of restaurant and bar recommendations, food delivery menus and suggestions on what to do. I highly recommend this comforting mountain retreat! It's really a pleasure to hear about guest having good time at Highcamp, and knowing that they see the same values in the house that I do. Life is good in Whistler, and Great at Highcamp! Whistler is a world-class year round vacation destination with many different activities and sites. It's wonderful at Whistler! Golf - 3 Championship Golf Courses in Whistler, plus 2 to the north and 2 to the south. No. 1 Ski Resort in North America. Two huge mountains with more skiable terrain than you can cover in a week. Ski season lasts until early June, then the glacier opens until August. Ski in and out from about 100 meters from my door, off the Creekside side of Whistler Moutain. Blackcomb base is less than 15 mins. away. Whistler Village parking lot is about 10 minutes away. Hiking and biking trails are right out side the front door. Highcamp is up in the trees and very quiet and peaceful.